Black and white photograph showing Italian Canadian Giuseppe Grittani shaking the hand of Italian movie star Gina Lollobrigida at an unknown event in the 1950s. 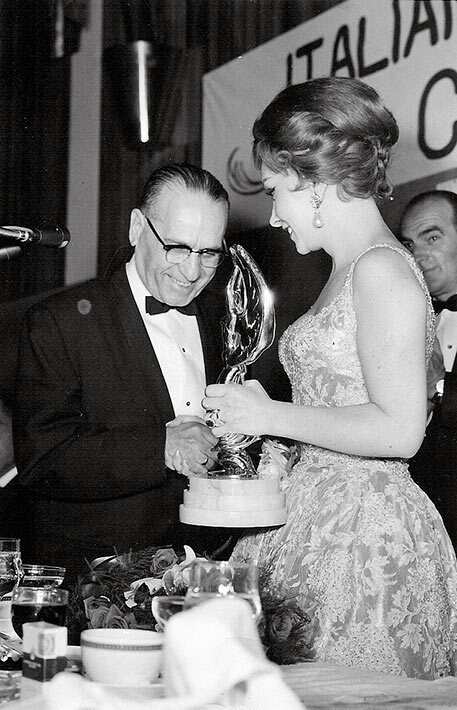 It is unclear from the photograph if Gina Lollobrigida is presenting Giuseppe Grittani with the award or if Grittani is presenting the award to the actress. The pair are shown shaking hands while looking down at the gold award. They stand in front of a microphone. In the background is a banner for the event, most likely an event associated with the Italian community. Giuseppe Grittani immigrated to Toronto, Canada in 1907. He married Elena on October 23, 1919 and the couple settled at 2 Northcliffe Blvd. where they raised three children, Gloria, Howard and Joe Jr. On June 10, 1940, Grittani was arrested by the RCMP. The family had no idea what had happened to him, but soon realized the serious nature of the situation when the RCMP came to search the family home. He was interned at Camp Petawawa for eight months before he was released on February 2, 1941. After his release, Grittani was involved in trying to have the Casa d’Italia returned to Toronto’s Italian Canadian community. It had been seized by Canadian authorities during World War II. In the 1950s, Grittani was the president of the Italian Immigrant Aid Society. He had been helping immigrants from his home town of Modugno since his arrival in Canada and continued this work after the war. Grittani also resumed his involvement in the Order Sons of Italy in the postwar period.